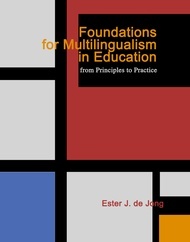 Ester J. de Jong is a professor of English as a second language (ESL)/bilingual education and the Director of the School of Teaching and Learning at the University of Florida, Gainesville. Originally from the Netherlands, she earned her doctoral degree in bilingual education from Boston University and worked for five years as the assistant director for bilingual education/ESL in Framingham, MA. Her research focuses on two-way bilingual education, language-in-education policy, and preparing mainstream teachers for educating bilingual students.